A space that epitomises true luxury. 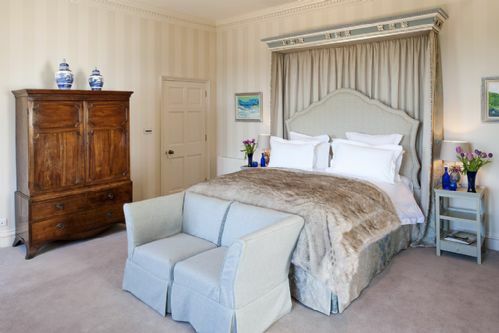 The Salamanca room furnished with a luxurious super king size, antique gilded tester bed and bedside tables with lamps. Decorated in tranquil shades of pale blue and silver, the room is completed by comfortable seating, flat screen television and full length mirror. 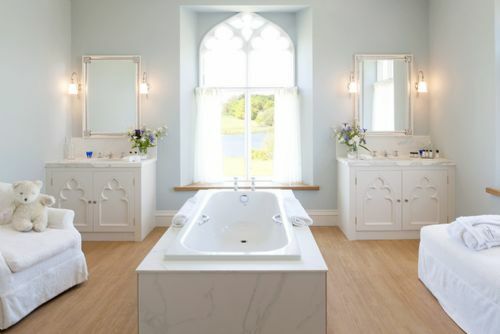 The opulent en suite bathroom features a marble clad bath, with spectacular views over the mere, full shower, toilet and his and hers basins. Tea and coffee making facilities are available in the room along with luggage racks for guests convenience. We used the accommodation as a stopover on a journey from North Scotland to Devon. We would certainly repeat the exercise for the same or similar journey. We had an excellent dinner at you recommended local pub,Combermere Arms. We did not ask but a taxi service would have been the icing on the cake. Excellent - Little piece of luxury! Thoroughly enjoyed our stay, excellent staff - nothing was too much trouble, polite, courteous and attentive. Room beautifully presented with luxurious decor, furnishings and linens. We will definitely be returning for another stay. A perfect three night stay in The Salamanca. The moment the car stopped the extremely pleasant house manager was there to introduce himself and to provide an introductory tour of the North Wing which revealed comfortable and elegantly furnished and decorated interiors complementing the Gothick style of the house, provision of the visitor's every reasonable need, and scrupulous cleanliness throughout. 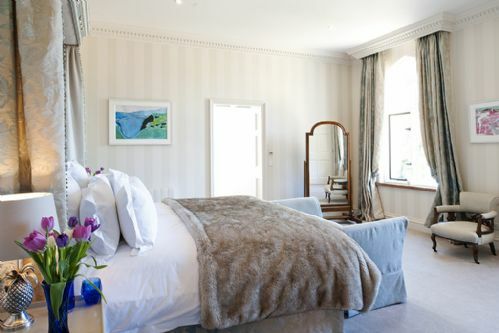 The Salamanca is a suite comprising an airy and very comfortable well furnished bedroom with views over the lake, an ensuite bathroom with modern fixtures, again views over the lake, and, unexpectedly, a sitting room. You cannot but be delighted. The dining room downstairs, which has another sitting room, thoughtfully provides self service tea with cakes in the afternoon, and of course the famed breakfast which is a generous spread of fruit, yogurts, honey, preserves from the estate and traditional English breakfast cooked by another delightful member of the staff. You are welcome to walk in the magnificent park in areas designated for your safety, dream that all this is yours, and then eventually, the worst part, leave. Thank you very much for your lovely review following your recent stay at The North Wing, Combermere Abbey. We are so pleased to hear that you had a wonderful stay, and we very much look forward to welcoming you back to Combermere Abbey Estate soon. We spent just one night at the North Wing in The Salamanca which is a stunningly beautiful room. It was a trip down memory lane as we got married at The Glasshouse at Combermere Abbey and it was lovely to walk around the grounds and down to the lake. The North Wing has been renovated to an incredibly high standard and makes the most of the glorious views. The room is spacious and comfortable with lovely touches such as home made biscuits, complimentary coffee machine and cake in the lounge downstairs. The personal greeting both on arrival and service at breakfast is exceptional. Would love to return for longer next time, the peace and tranquility is priceless. Thank you very much for your lovely review following your recent stay at The North Wing B&B. We are so pleased to hear that you had a wonderful stay with us, and that you were able to come back to a place that holds such special memories for you! We very much look forward to welcoming you back to Combermere Abbey Estate soon. a wonderful stay over provided by Stefan our host with his meticulous attention to detail. The accommodation was stunning and the facilities exceptional. The breakfast was amazing especially the presentation and catering for a vegetarian. It has to be the best setting to be in. I can't wait to return with my family. Thank you so much! It was a shame it was a work stay over. I was sad to leave. Such a beautiful location. We loved everything about it! Such a beautiful place to stay. The best way to see in the new year. The attention to detail was amazing and we had the best breakfast! Nothing was too much trouble. Beautiful from start to finish!